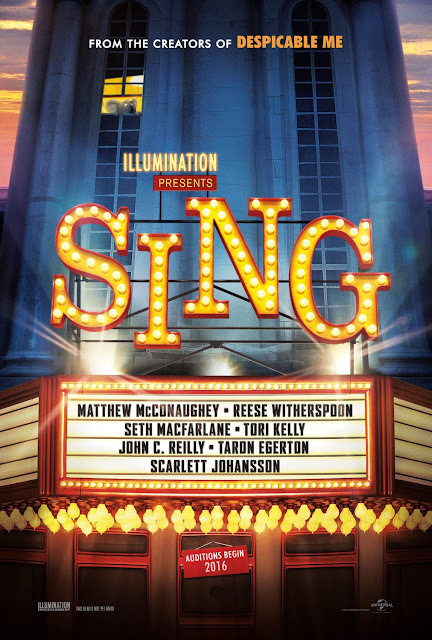 The first full length trailer to Illumination's 'Sing' has arrived. From the creators of Despicable Me comes an animation about a singing contest. Following the success of Disney's 'Zootopia', the animal filled film has some big shoes to fill, but distancing it as far as possible in terms of release date may be a valid strategy. What's more, the popularity of singing shows such as the X Factor and The Voice shows that there is indeed some interest for this sort of thing, but how will it work in a movie format? 'Sing' tells the story of 5 animal finalists, voiced by Reese Witherspoon, Scarlett Johansson, Matther McConaughey, Taron Egerton and John C Reilly, each with their own financial needs that the prize money would mean a lot to... but who will come out as the winner?